How to play We hate rules too! Create a Dinkee & become a legend! 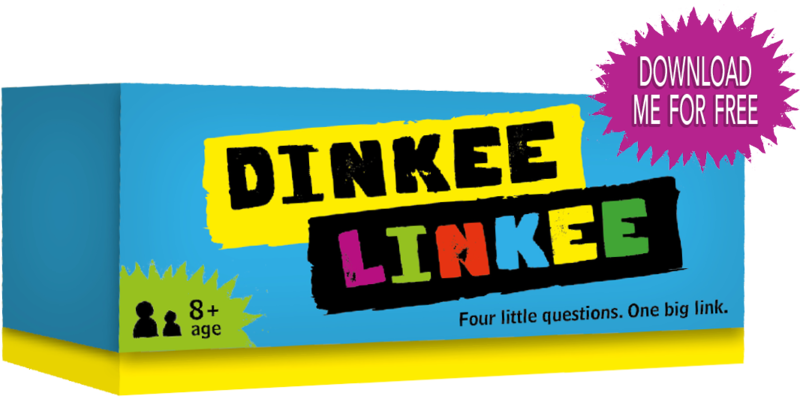 Dinkee Linkee is big Linkee’s younger, cheekier brother. The rules to Dinkee are just the same as Linkee, it’s just the questions which are different, they have been written for kids, by kids. Have a go at the cards below, or if you’re feeling creative, download and play our special ‘Blue Peter’ style make-one-at-home edition. Name the popular food made by Captain Birds Eye that’s covered in breadcrumbs. Name the glass that reflect a car's headlights? You find them in the middle of the road in the tarmac. Twelve inches equal one ‘what’? Name Noddy’s friend who is a wise bearded gnome. Who is Winnie-the-Pooh’s best friend? Who is Susie Sheep’s best friend? In the book Charlotte’s Web, who was Charlotte’s four-legged friend? Who is Kermit the Frog’s girlfriend? Which supermarket is famous for selling frozen food? What sort of pepper is very hot? Which bird is typically eaten at Christmas? What are the biggest animals in the world? They live in the sea and can longer than two buses. What is another name for a baked potato? A container full of costumes is called a fancy 'what' box? If a player scores three goals in a game it’s called a 'what'? A person who walks along a wire at the circus is called a 'what' rope walker? The Owl and 'who' went to sea in a pea-green boat? Children often keep their money in what kind of little bank they keep at home? A sausage in a bun is called a hot 'what'? Whose grandmother was eaten by the Big Bad Wolf? What is the most common fruit juice people drink at breakfast? Snoopy's best friend is called Charlie 'who'? Who lived with seven dwarves in the famous fairy tale? Snow _____.